Mrs. D here from The Third Wheel. Hope you are having a fabulous Labor Day weekend! Just finished up my first week of school, and now I am gearing up for Parent Night in about a week. I always prepare my presentation in advance and get my forms into file folders to help make it easy to prepare after school on the big day. This year I've decided to add a little extra something to thank my parents for their willingness to partner with me to support their child's education. I am popping by my local Target this afternoon to pick up a pack of 100 Grand candy bars (gotta love Halloween time...everything comes in mini-size). 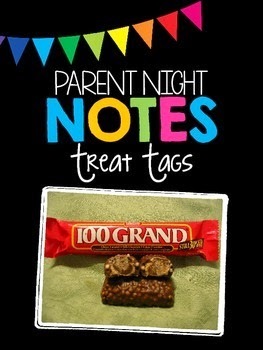 I've prepared a set of treat tags that can easily be attached as a quick and easy thank you. These are also great as an end-of-year conference gift for parents. Get your copy by clicking the image below.